Through-hole assembly is a manufacturing method where small holes are put into the circuit board and leads are threaded through to the opposite side. Once the leads are threaded, they are soldered into place. This method must either be done using a wave-soldering machine, or by hand. Though it is a very reliable assembly technique, through-hole lost some practicality when circuit boards started getting very small to accommodate smaller and lighter technology. There is only so much space on a circuit board, which limits the number of holes and components that can be assembled on it. However, there are still instances where the disadvantages of through-hole assembly for your PCB assembly are either of no concern or they are eclipsed by through-hole’s superior reliability. In military and aerospace PCB assembly applications, for example, safety and durability are of the greatest importance. Additionally, these industries present a range of extreme environments, temperatures, and other stressors that an assembly must be able to endure without failure. Through-hole assemblies may take up more space than other assembly techniques, but they also create a stronger and more reliable bond. Because of this, through-hole assembly remains a preferred choice for military and aerospace applications. So while through hole assembly might seem like a dinosaur technique against the current electronics market, there is definitely still a place for it where durability is most important. Fortunately, Levison Enterprises provides through-hole assembly and invests heavily in maintaining a high-quality standard for every product, through-hole or not. Levison Enterprises proudly maintains AS9100, ISO9001, IPC, and J Standard certifications. The maintenance of all these standards ensures a quality product and one that adheres to the highest safety and workmanship demands in manufacturing. AS9100 is used by the aerospace industry to apply a highly stringent quality standard. Here at Levison Enterprises, we maintain this demanding set of standards and apply it to all assemblies we complete, regardless of the industry in which they will be used. ISO9001 is a broadly recognized certification that relates to customer satisfaction and regulatory requirements. Levison Enterprises fulfills the requirements of this certification from safety and quality to communication with our customers. Finally, the IPC and J Standards relate specifically to workmanship for cables and circuit board assemblies. These international standards are highly regarded within electronics manufacturing and Levison Enterprises works hard to stay at the forefront of every quality benchmark provided within both standards. 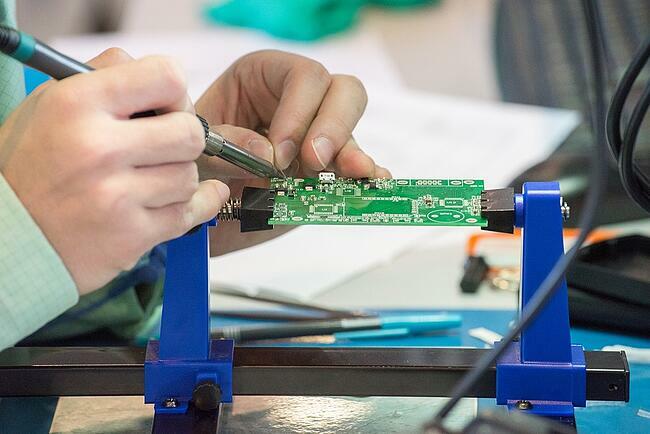 We believe in this so thoroughly that the entire production staff at Levison Enterprises is IPC J Standard certified for soldering and inspecting up to IPC-A-610 standards. Through-hole assembly is, in itself, a more durable and reliable assembly. When created by a highly skilled, quality manufacturer, your product will be second to none. While demand may have decreased for through-hole assembly, it has never disappeared from the lineup of service offerings at Levison Enterprises. Our staff has been providing high-quality through-hole assembly for many years and has acquired extensive training and expertise in the process. We are able to accommodate hand soldering or wave soldering by machine for through-hole printed circuit boards. We can vary the method of through-hole production to match the PCB assembly needs of every customer. The same can be said for Levison Enterprises’ approach to other assembly processes, including surface mount technologies. It’s always customer and quality first at Levison Enterprises. What is most important to us is that our customers get the best possible service and product, regardless of whether we are using a through-hole or SMT approach. This is why we provide both types of assembly manufacturing at Levison Enterprises. If through-hole is a consideration for your project, contact Levison Enterprises and we can provide information to help demonstrate the value of through-hole for your project. Additionally, our highly-skilled team of engineers can work with you to help determine which assembly technique will serve you and your goals the best.